Mixed reality, artificial intelligence and other innovations are rapidly shifting the landscape of media and society. 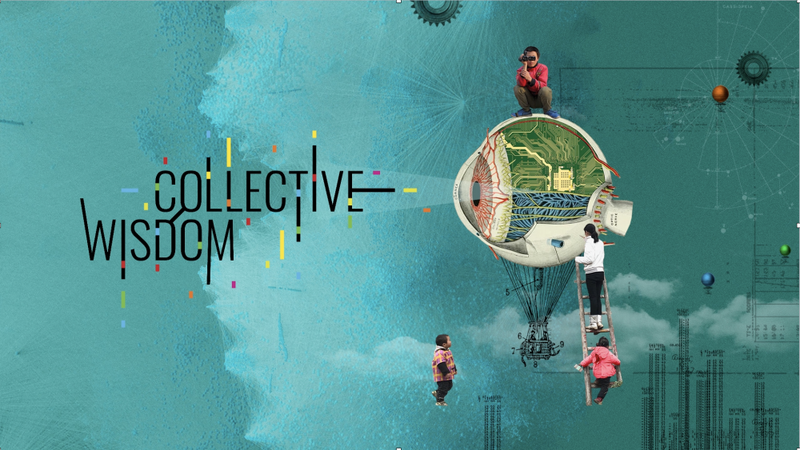 As storytellers, we have a central role to play in envisioning and catalyzing what the future holds. The Getting Real conference addressed emerging media technologies and creative praxis at a number of different sessions. 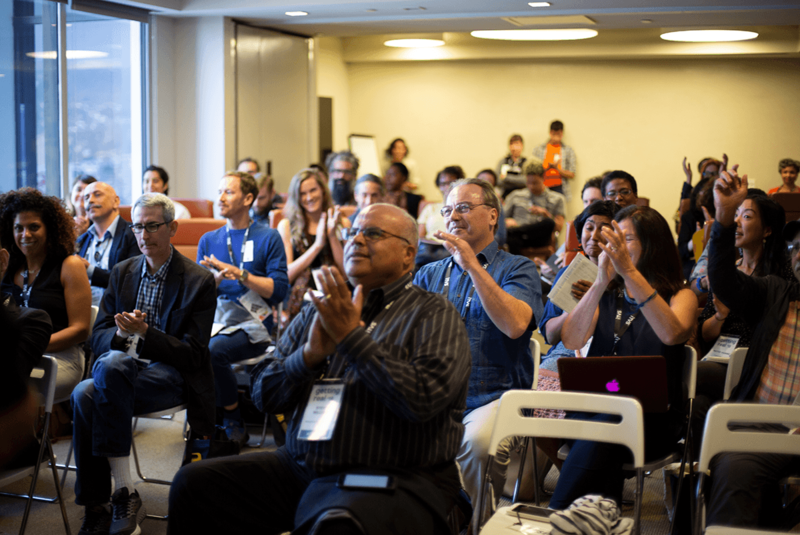 These presentations showcased exciting applications of new media in documentary and other creative domains, but also shared an emphasis on the sweeping social impact—both positive and negative—of new technologies. What are the creative potentials and the ethical implications of these emerging media? How can we increase access and literacy around new technology? Whose voices will be included in future narratives? How can we use media and storytelling to collectively shape a more just and inclusive future? These are some of the questions that took center stage in a series of thought-provoking conversations. 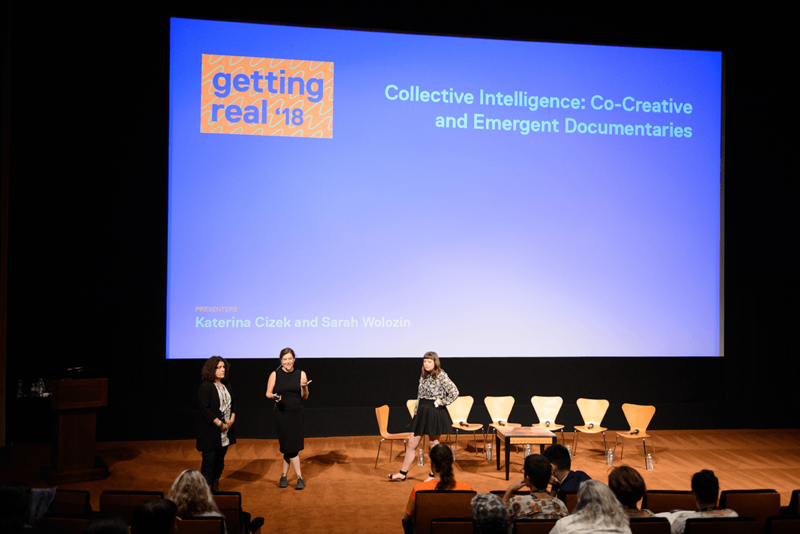 Sarah Wolozin, director of the MIT Open Documentary Lab, and Katerina Cizek, a pioneer in digital and co-created documentaries, led a “live cinema performance”—a unique presentation that combined their narration with a series of film clips. At MIT, Wolozin and Cizek are spearheading a new Co-Creation Studio that researches, incubates and produces co-created documentary projects. The presentation began by reminding the audience that documentarians have often been in the vanguard of innovation with emerging technologies. Cizek noted, “More than 90 percent of the films made in the first decade of cinema were documentaries.” Wolozin and Cizek recounted examples of media technology that empowered regular people to document their lives in creative and collaborative ways, like the Kodak Brownie camera, the Handycam and of course, the Internet. Wolozin recalled how the early years of the Internet inspired “a flowering of documentaries by people who saw the democratic and artistic potential of the World Wide Web.” Many of these pioneering digital projects were profoundly co-creative, stemming from community collaborations and elevating voices that had been largely absent from traditional media. One example was Sight Machine, a performance in which artist Trevor Paglen collaborates with the Kronos Quartet and AI to reveal the way machines “see” humans. Another was New Dimensions in Testimony, a project by the USC Shoah Foundation in which filmed interviews, 3D recording technology and AI allow participants to have a virtual conversation with a Holocaust survivor. These projects represent co-creations between artists, machines, algorithms and participants. After the presentation, the audience was eager to learn more about both co-creation and new media technology. Many filmmakers in attendance wanted to know how creators in more traditional media could participate and create in this emerging space. Wolozin and Cizek directed them to resources including MIT Open Documentary Lab’s website Docubase and online publication Immerse, and a forthcoming field study from the Co-Creation Studio. Delving into the question of what constitutes “emerging media,” Sinclair showcased a rapid-fire series of projects that underscored the vast scope of the field. Initial examples represented categories that were relatively familiar to many attendees, like data storytelling and virtual reality. As the presentation progressed, however, and Sinclair described real-time performance via avatars, generative art co-created with artificial intelligence, bio-responsive exoskeletons, and digital media transferred onto strands of DNA, there was a growing sense that we were entering science fiction territory. These changes represent exciting possibilities, but also prompt existential questions about art, society and reality. When AI can write passable novels, what does it mean to be an artist? What does it mean to be human when futurists are attempting to hack the body and brain in order to become “post-biological”? How does the ability to create a responsive, AI-enabled avatar of a deceased person—as a number of projects have already done—impact our conceptions of mortality, loss and legacy? Along with these daunting questions, this surge of new media technology raises many concerns around inequality and oppression. Specific problems noted in Sinclair’s research include gaps in participation by marginalized groups; silos and groupthink; algorithmic bias; and a lack of security, privacy and regulation in emerging media. Together, they point to a dystopian near future where few voices are heard, and few rights are protected. So what can be done? Sinclair emphasized, “We need to not just hope for inclusion out of the goodness of people’s hearts. We need to make sure that we are creating systems for that inclusion to happen.” Thankfully, Sinclair’s interviews yielded many suggestions for interventions to “bend the technology to justice,” in the words of Joshua Breitbart, senior advisor for broadband at the Office of the Mayor in New York City. One of the central themes of the proposed interventions was the importance of including diverse perspectives, communities and fields of expertise in imagining the future. Recommendations to further this goal included lowering barriers to entry; creating new media and tech pipelines; promoting awareness of personal bias; embedding artists with technologists and scientists — and vice versa; and supporting funding parity for creators and entrepreneurs of color. 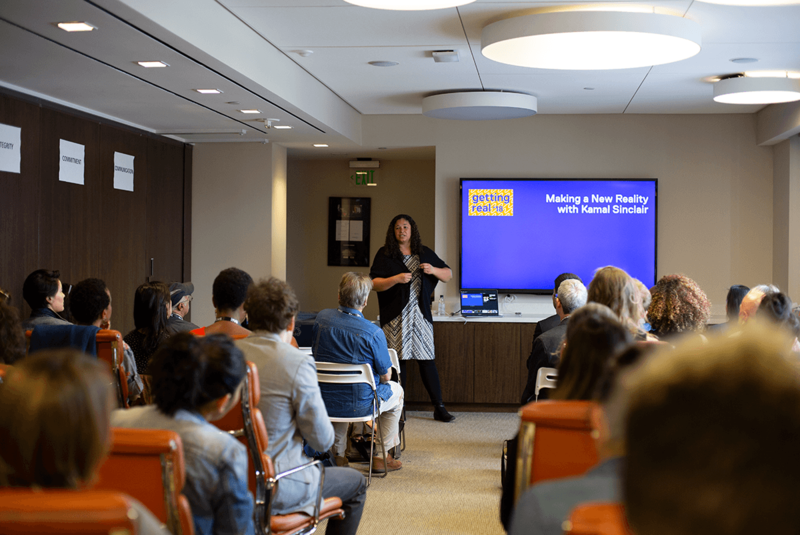 After Sinclair’s session, a small group of funders, programmers and art administrators gathered to discuss how to realize these objectives and implement the project’s findings. Opeyemi Olukemi, executive producer at POV Spark and vice president of American Documentary’s Interactive unit, helped organize and facilitate the conversation. Participants welcomed the report as “something to stand on…We could use the report to push back against things we were seeing in our own organizations and networks,” said Olukemi. Sue Ding is a documentary filmmaker and emerging media consultant based in Los Angeles. She has written about documentary and emerging media for IndieWire, Immerse and MIT Open Documentary Lab.